Precise vapor control is critical to successful soil vapor extraction and treatment projects. 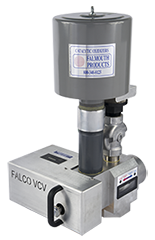 Falmouth Products Vapor Control Valve (VCV) is installed in-line on the vacuum side of the extraction blower. 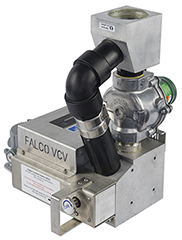 The VCV enables the FALCO catalytic oxidizer to start up, operate automatically, and cooperate with the temperature controllers to regulate input vapors. The VCV minimizes power use by accurately maintaining maximum input concentration consistent with the heat recovery adjustment. The VCV includes a valve body, valve disc, two valve seats, and a small gear motor. The motor progressively opens and closes the valve in response to input from the three temperature controllers. The valve simultaneously regulates dilution air and source vapors by positioning the valve disc. Controller rate alarms regulate how quickly the VCV introduces vapors. A solenoid valve provides rapid introduction of dilution air, regardless of valve position. The valve automatically returns to its closed position each time FALCO catalytic oxidizer power is cycled. View an interactive demonstration of the process.